The cumulative effect of a large number of I/O requests can have a significant impact on performance and responsiveness. Network calls and other I/O operations are inherently slow compared to compute tasks. Each I/O request typically has significant overhead, and the cumulative effect of numerous I/O operations can slow down the system. Here are some common causes of chatty I/O. Query the subcategory from the ProductSubcategory table. Find all products in that subcategory by querying the Product table. For each product, query the pricing data from the ProductPriceListHistory table. The application uses Entity Framework to query the database. You can find the complete sample here. // Find products in that category. // Find price history for each product. This example shows the problem explicitly, but sometimes an O/RM can mask the problem, if it implicitly fetches child records one at a time. This is known as the "N+1 problem". This often happens when developers try to follow an object-oriented paradigm, and treat remote objects as if they were local objects in memory. This can result in too many network round trips. For example, the following web API exposes the individual properties of User objects through individual HTTP GET methods. While there's nothing technically wrong with this approach, most clients will probably need to get several properties for each User, resulting in client code like the following. File I/O involves opening a file and moving to the appropriate point before reading or writing data. When the operation is complete, the file might be closed to save operating system resources. An application that continually reads and writes small amounts of information to a file will generate significant I/O overhead. Small write requests can also lead to file fragmentation, slowing subsequent I/O operations still further. The following example uses a FileStream to write a Customer object to a file. Creating the FileStream opens the file, and disposing it closes the file. (The using statement automatically disposes the FileStream object.) If the application calls this method repeatedly as new customers are added, the I/O overhead can accumulate quickly. 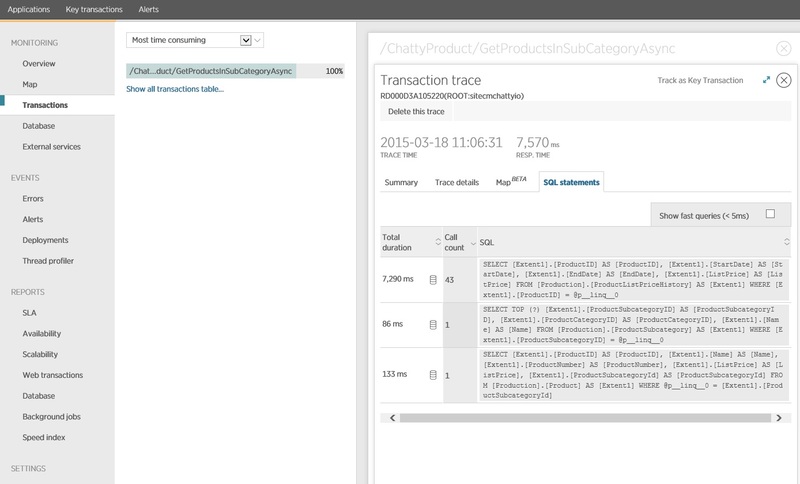 Reduce the number of I/O requests by packaging the data into larger, fewer requests. Fetch data from a database as a single query, instead of several smaller queries. Here's a revised version of the code that retrieves product information. Follow REST design principles for web APIs. Here's a revised version of the web API from the earlier example. Instead of separate GET methods for each property, there is a single GET method that returns the User. This results in a larger response body per request, but each client is likely to make fewer API calls. For file I/O, consider buffering data in memory and then writing the buffered data to a file as a single operation. This approach reduces the overhead from repeatedly opening and closing the file, and helps to reduce fragmentation of the file on disk. // In-memory buffer for customers. The first two examples make fewer I/O calls, but each one retrieves more information. You must consider the tradeoff between these two factors. The right answer will depend on the actual usage patterns. For example, in the web API example, it might turn out that clients often need just the user name. In that case, it might make sense to expose it as a separate API call. For more information, see the Extraneous Fetching antipattern. When reading data, do not make your I/O requests too large. An application should only retrieve the information that it is likely to use. Sometimes it helps to partition the information for an object into two chunks, frequently accessed data that accounts for most requests, and less frequently accessed data that is used rarely. Often the most frequently accessed data is a relatively small portion of the total data for an object, so returning just that portion can save significant I/O overhead. When writing data, avoid locking resources for longer than necessary, to reduce the chances of contention during a lengthy operation. If a write operation spans multiple data stores, files, or services, then adopt an eventually consistent approach. See Data Consistency guidance. If you buffer data in memory before writing it, the data is vulnerable if the process crashes. If the data rate typically has bursts or is relatively sparse, it may be safer to buffer the data in an external durable queue such as Event Hubs. Consider caching data that you retrieve from a service or a database. This can help to reduce the volume of I/O by avoiding repeated requests for the same data. For more information, see Caching best practices. 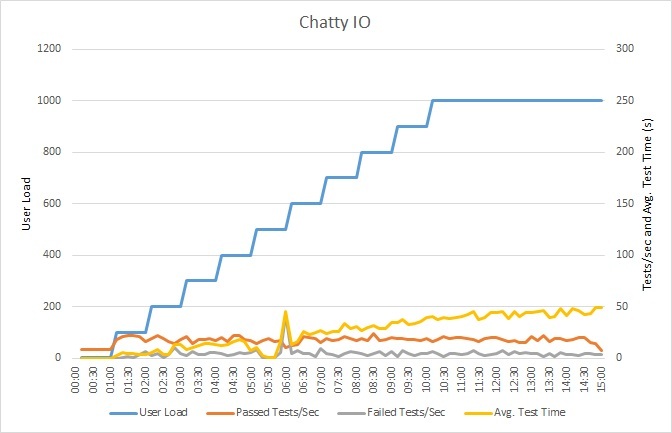 Symptoms of chatty I/O include high latency and low throughput. End users are likely to report extended response times or failures caused by services timing out, due to increased contention for I/O resources. Perform process monitoring of the production system to identify operations with poor response times. Perform load testing of each operation identified in the previous step. During the load tests, gather telemetry data about the data access requests made by each operation. Gather detailed statistics for each request sent to a data store. Profile the application in the test environment to establish where possible I/O bottlenecks might be occurring. A large number of small I/O requests made to the same file. A large number of small network requests made by an application instance to the same service. A large number of small requests made by an application instance to the same data store. Applications and services becoming I/O bound. The following sections apply these steps to the example shown earlier that queries a database. 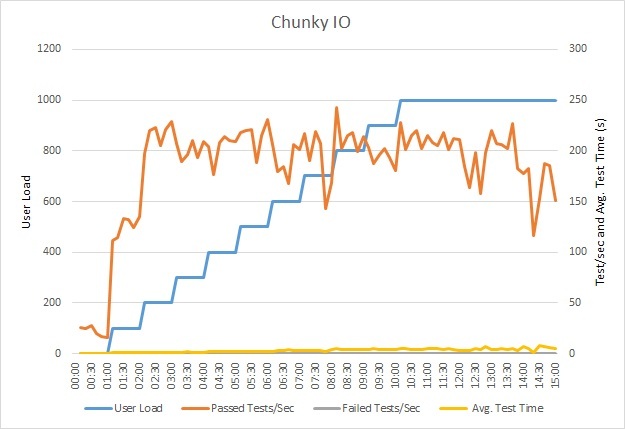 This graph shows the results of load testing. Median response time is measured in 10s of seconds per request. The graph shows very high latency. With a load of 1000 users, a user might have to wait for nearly a minute to see the results of a query. The application was deployed as an Azure App Service web app, using Azure SQL Database. The load test used a simulated step workload of up to 1000 concurrent users. The database was configured with a connection pool supporting up to 1000 concurrent connections, to reduce the chance that contention for connections would affect the results. 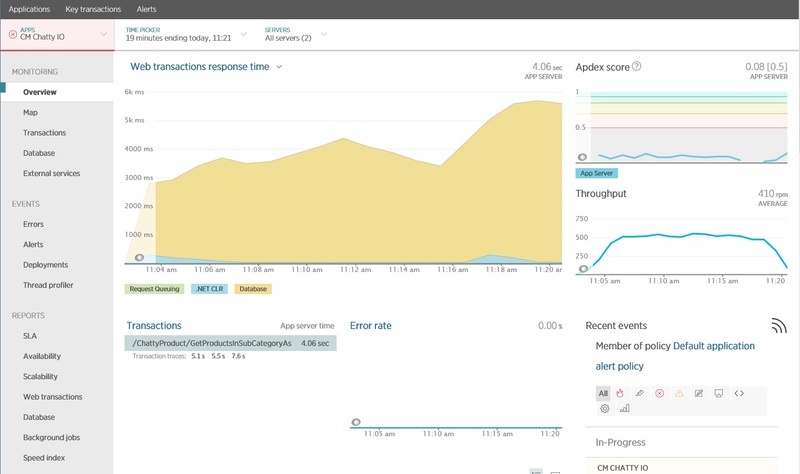 You can use an application performance monitoring (APM) package to capture and analyze the key metrics that might identify chatty I/O. 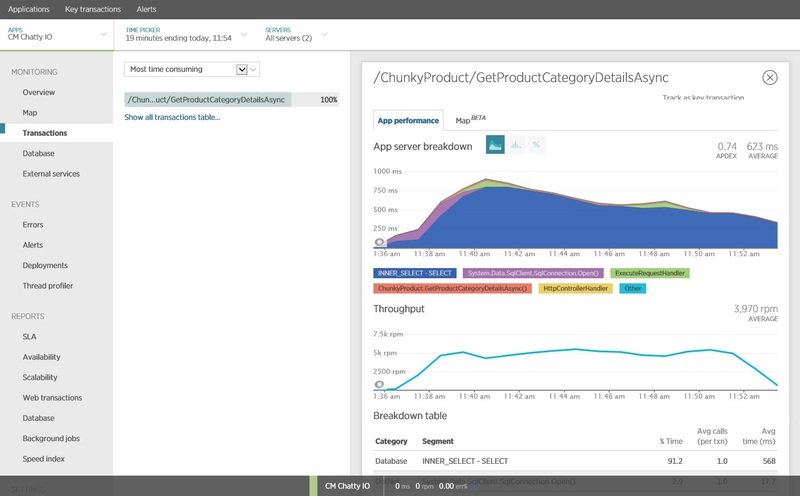 Which metrics are important will depend on the I/O workload. 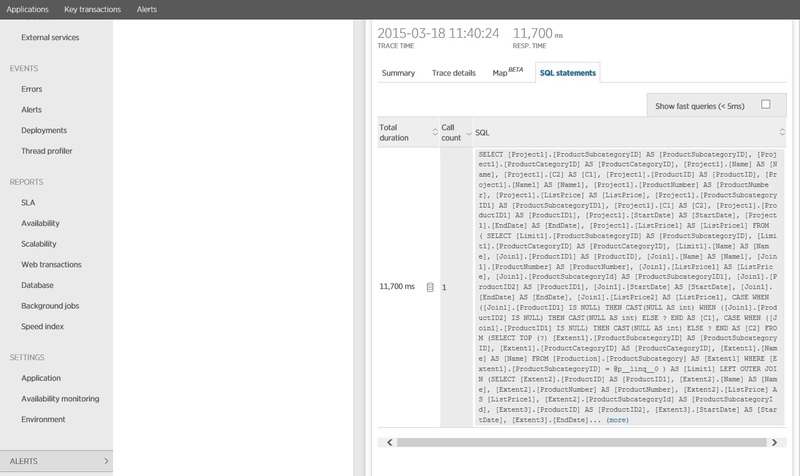 For this example, the interesting I/O requests were the database queries. 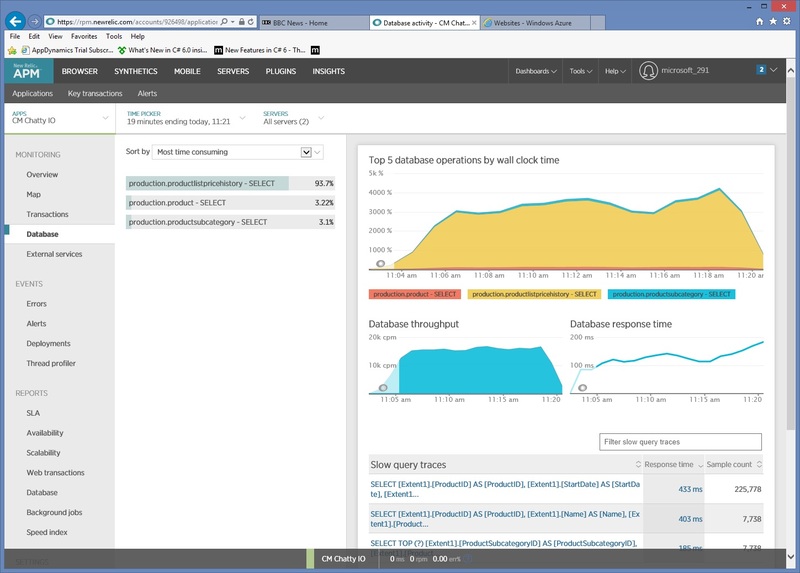 The following image shows results generated using New Relic APM. The average database response time peaked at approximately 5.6 seconds per request during the maximum workload. The system was able to support an average of 410 requests per minute throughout the test. 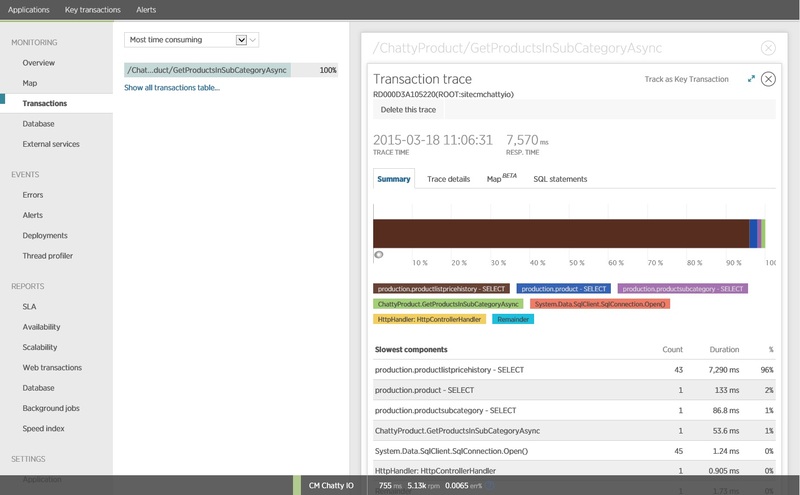 Digging deeper into the monitoring data shows the application executes three different SQL SELECT statements. These correspond to the requests generated by Entity Framework to fetch data from the ProductListPriceHistory, Product, and ProductSubcategory tables. Furthermore, the query that retrieves data from the ProductListPriceHistory table is by far the most frequently executed SELECT statement, by an order of magnitude. It turns out that the GetProductsInSubCategoryAsync method, shown earlier, performs 45 SELECT queries. Each query causes the application to open a new SQL connection. This image shows trace information for the slowest instance of the GetProductsInSubCategoryAsync operation in the load test. In a production environment, it's useful to examine traces of the slowest instances, to see if there is a pattern that suggests a problem. If you just look at the average values, you might overlook problems that will get dramatically worse under load. The next image shows the actual SQL statements that were issued. The query that fetches price information is run for each individual product in the product subcategory. Using a join would considerably reduce the number of database calls. If you are using an O/RM, such as Entity Framework, tracing the SQL queries can provide insight into how the O/RM translates programmatic calls into SQL statements, and indicate areas where data access might be optimized. Rewriting the call to Entity Framework produced the following results. This load test was performed on the same deployment, using the same load profile. This time the graph shows much lower latency. The average request time at 1000 users is between 5 and 6 seconds, down from nearly a minute. This time the system supported an average of 3,970 requests per minute, compared to 410 for the earlier test. Tracing the SQL statement shows that all the data is fetched in a single SELECT statement. Although this query is considerably more complex, it is performed only once per operation. And while complex joins can become expensive, relational database systems are optimized for this type of query.